I made my first solar box cooker about three months ago. I opted for a simple box cooker due to the difficulty of finding materials where we currently are (Arequipa, Peru) and my limited time and budget. I used a box used for reams of paper for the inner box because this fit a piece of window glass I found. I based my plans on the "Minimum" Solar Box Cooker found at http://solarcooking.wikia.com. I used tinfoil to line the inside and to make the reflector. This cooker worked fairly well, with high temperatures of around 230 degrees Fahrenheit when empty. 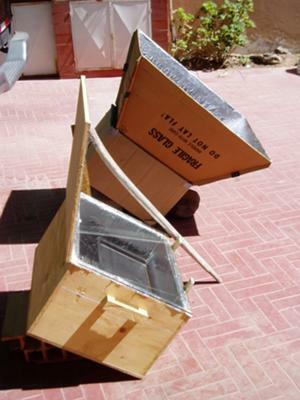 From this experience, I was hooked on solar cooking and decided to make a second cooker along the same lines but using plywood for the exterior to make it last longer. I made it larger to fit a large cookie sheet or large pan to cook in. I also made the reflector from a glass mirror glued to a piece of plywood. Unfortunately, this oven didn't perform as well as the first oven, probably due to the larger size. So, I went back to the drawing board. As a proof for the third oven, I decided to re-use the first box cooker made out of cardboard. I used the plans for the "Heaven's Flame" found at the solar cooking wikia above and just added panel reflectors to the box, some more insulation and tilted it toward the sun. I was totally amazed at the improvement! My cooker now would reach high temperatures around 350 degrees Fahrenheit! I started using this improved cooker for everything - soups, bread, rolls, roasts, chicken, apple crisp, etc. I still used the plywood oven for things like granola and things that cook at a lower temperature all day. I am currently looking for materials to make a 60/30 oven using plywood as an exterior and cardboard lined with tinfoil as insulation. Because of the angle that the cardboard oven needs to be at, I can't make a large pot of soup or stew due to spilling liquids. I am hoping that the 60/30 solar oven will be the last cooker I need to make. I am also making it with the intention that it will easily connect to a homemade food dehydrator that I hope to make once I am finished with the oven. It will also be better insulated than either of the above ovens because, though they perform well in Peru at 7000 feet, they won't perform as well in New York once we return to the USA. And a great example of how to make solar cookers even in areas that are lacking in many of the resources that we take for granted. This is exactly the knowledge and skills that the people in many third world countries need in order to help them in their desperate plights. I made also an oven from cardboard. Not tried it yet. putting the final touches now. I would like to know how you handle condensation inside and what you do to prevent it. I fear cardboard will soak and distract. Here is a very simple solar panel cooker that is effective enough to cook a 3.5 quart pot of cinnamon apples. It takes a little longer than a commercial solar cooker but if you give it enough time it will cook your food. We use this all the time.